The small town of Circello is at 700 meters/2100 feet in the hills of the province of Benevento 8 km/5 mi NE of Lake Campolattaro, not far from Naples. From tourist brochures it seems to be a typical rural community dotted with reminders of the Italian middle ages: there's the almost obligatory (for southern Italy) remnant of a Norman castle, a church from the 11th century, an ex-monastery and a Ducal Palace to remind us of the persistence of medieval feudalism in southern Italy for many centuries. There are even nice little historical notes here and there to tell is that the name of the town comes from cercie, the dialect word for quercia, the oak tree. The site has a much older history, of course, as well, finding mention in Roman records, but even that it is not remarkable, for the hills of Campania once knew the presence of tribes with now remote names: the Samnites, Opicians, Ausoni, etc. all contemporaries of early Rome when that Latin tribe was still struggling towards empire (starting in around 300 BC). We know how the Roman struggle against the Samnites and all the others turned out —(spoiler alert!) the Romans won. Here is where the Ligurians come in. (Liguria is the name for the modern Italian region of which Genoa is the capital city, a sliver of coastal land in the extreme northwest (on the coast above and to the left of the marked mountain range in the image, top right). And hundreds of miles to the south just a few meters below the center of Circello is a part of town called Macchia (image, right). Historically it was called, in Latin, Ligures Baebiani et Corneliani; in modern Italian, it is shortened generally to Liguri Berbiani. That is, "Ligurians" plus the name of the Roman consul responsible for the mass deportation (!) of 40,000 Ligurian men, women and children moved from their homeland in the Apuan Alps in the north down to the hills of Samnium onto land that the Romans had taken from the Samnites. The Romans called these people Liguri Apuani. "Apua" does not derive from the similar sounding "Alps" but is apparently the ancient name of the city of Pontremoli (70 km/45 miles east of Genoa). "Apuan" today is used as an adjective for the Apuan Alps and a few other things, including the Apuan Diocese. The episode of the deportation is well-documented by Roman historian Livy in his monumental history of Rome, Ab Urbe condita libri (Books from the Foundation of the City). These Liguri apuani were deported in the year 181 BC in an attempt to break up what had been a constant thorn in the side of the Romans. The Ligurian tribe (or tribes, no one seems to be sure) had sided with Hannibal during his invasion of the peninsula in the Second Punic War, which had just ended. That was not unusual. There were indeed some Italic tribes that were not overjoyed at being gobbled up by Rome; they fought and lost. Now Rome was taking vengeance —disperse them, even kill them, if you must (which is what happened to the Samnites 100 years later). The consuls and senate decided to remove them such that they had no hope of ever returning to their homes...that was the only way to put an end to the wars in Liguria...40,000 men, women and children were moved at public expense and provided with 150,000 silver dinars to buy provisions in their new homes. in the National Roman Museum. That colony of Ligurians in Campania is known to have existed for the remainder of the western Roman empire and even to have thrived, no doubt thoroughly "Romanized", by the addition of returning war veterans as part of the Roman process of "centurionization" (rewarding veterans with free land). After the fall of Rome, of course, everything went downhill quickly. The Gothic Wars (the final battle of which was fought at nearby Mons Lactarius) were ferociously destructive. Italy split into pieces. The new kids on the block, the Arabs (termed Saracens), invaded the coasts and destroyed the old Ligurian community at Macchia such that the inhabitants fled and started other communities, once of which was named Circello. The Dark Ages and feudalism had arrived in the south, with no real allegiance to central authority except to a distant monarch, a dynastic king, whether Norman, Swabian, French, or whatever. Circello probably suffered no more than similar communities, all of which were hit by various disasters such as plague, earthquakes and wars. It may be that the small Ligurian community, even if tightly knit at the very beginning, simply faded away, dispersed into the general mixed genetic background noise of history. Who were they originally, these people who had given the Romans so much trouble? There is really no consensus of opinion, and there are lot of opinions. One plausible view is that they were a very early Indo-European people that had come into northern Italy right at the very beginning (2500-2000 BC). Somewhat more ambitious is the view that they were indigenous; that is, descendants of the stone-age peoples who lived in the area for tens of thousands of years, people that were largely displaced or overrun by later Indo-Europeans. They were probably not related to the later Celts (Indo-European), although mixed populations were bound to arise. Greek geographer and historian, Strabo, speaks of them as being distinct from Celts or the Gallic tribes. They were probably spread out more than in that little area of the northern Apennines in modern Tuscany. How far they may have spread into what is modern Frances is speculative. Whether they were related to the isolated Basques of western France (!) is really speculative, and whether they came from India (!) because some of the rivers in Italy had ancient names similar to some names in the Tamil language on the Indian sub-continent...—well, there is no shortage of extravagant speculation when there is great shortage of evidence. Back to the little mystery at the base of the tower of Sant'Angelo in Circello. It would help if we could read the markings, but we can't. Really, if you mean alphabetic markings, there is nothing to read. There may be symbols somewhere on it. (More below. Population Genetics...is a branch of molecular biology that studies the distribution and changes in genetic markers in populations over time. These studies can often be used to show relationships among widely separated populations and trace them to a common origin. Technically, anything like the item shown in the image, in very broad terms, can be termed "rock art"; that is, an engraving or painting on a stone surface, something that is viewed as a cultural statement, something meant to last and be transmitted, remembered. Rock art is a worldwide phenomenon and many famous examples exist in Europe that go back 40,000 years, such as the ornate paintings of animals on the walls of caves in France and Spain. The item shown here, however, is much younger for at least the one reason that it is not sculpted on a stationary rock wall; it a special kind of rock art called a stele; that is, a portable stone slab or block, quarried, cut to size and meant to be erected as a monument or to serve a social purpose (such as a boundary marker or even a tombstone). In Europe they are typically found in the area south of the Valcamonica in northern Italy quite near the area under discussion in the case of the stele in the image. I had misinterpreted a brochure description of the stone: it said "human figure with an undeciphered inscription, attributed to the Ligurians." I don't see an inscription (unless some part of the figure is a pictogram (a picture that exists as part of a wider non-alphabetic writing system), but I suspect not. The stone carving is dated to the 7th or 8th century AD (sic),* centuries after the Ligurian deportation, yet it bears a striking resemblance to similar objects found in the Apuan Alps, precisely to those steles of the last period in which they were made, meaning after 800 BC (sic) until they became too "Romanized" to be called Ligurian (one sign of which might have been ornamentation with some alphabetic writing). Some sources accept the interpretation that it is "Ligurian" just from the way it looks, but which Ligurians? The original ones? Did they bring this object with them when they were deported, something like the Children of Israel carrying around the Ark of the Covenant? Even if that were possible, the stele has been dated* to the 7th or 8th century AD, so we have to find another possibility. One that suggests itself is that the stele is a product of the Middle Ages, produced by the remnant Ligurian community as a reminder of their own past and was then later (13th century) built into the church tower. If that is plausible, it explains the much older pre-Roman look. Maybe in pre-Roman times, it would have been a divinity or a heroic tribal ancestor, for example. Around 60 such steles have been found in northern Italy. Stylistically, they change over time. 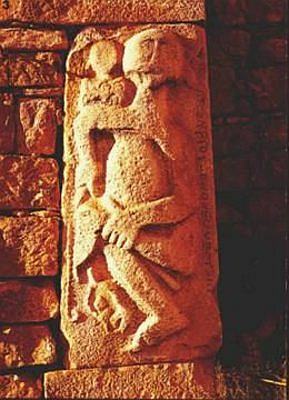 Ones from this final period were all male, which is interesting since earlier carvings included female figures. I'm guessing, but this may be part of the general shift in Europe (and elsewhere) away from Earth Mother to Hairy Thunderer and is another style trait for putting a rough date on these items. Also, the carving is finer: the rounded skull, developed facial features, etc. Also, stone carvings might indicate by some symbol not evident to non-experts (as I am not) some level of societal complexity; that is —as an example only— if there is a symbol to indicate a ruler or king, then you are dealing with at least a chiefdom, a relatively advanced social unit with hereditary privilege, and not just a band or tribe. That is just an example, but there are many things that can be learned about a group from their symbols even in the absence of writing. The Ligurians are described in Roman literature as being adept with weapons and as highly "magico-religious". Presumably at least some of that can be inferred from the rock carvings they left behind. They might have originally been set in a funerary or religious display. But if the stele in place in the tower is really from the 7th or 8th century AD,* then it is either a reproduction or a fanciful original with only a coincidental similarity to pre-Roman carvings. Again, it is similar to objects from the end of a long period of anthropomorphic rock carvings in northern Italy going back to the fourth millennium BC. * At least some sources (Catalano), however, put the sculpture in the context of other similar items from the Middle Ages found elsewhere in the same general Samnium area of Campania and make no mention of a purported relationship to pre-Roman ancient Ligurian art. *Dating objects from the past. Dating techniques fall into two types: relative and absolute. The simplest form of relative dating uses stratigraphy; that is, examining the vertical relationship among objects found at a site. The assumption is that the objects on the bottom were deposited before (and are thus older than) the objects on top (assuming that nothing has disturbed their relative positions, such as floods, earthquakes, etc.) "Seriation" or stylistics is another form of relative dating; it is complex but at least one kind of seriation notes the simple-to-complex development of rock carvings (the case in point here); here, the assumption is that single-line stick figures are older than more developed anthropomorphic forms with more fully developed features. Note that none of this so far gives you an absolute date. The easiest kind of absolute dating would be to find an artifact of known age such as an ancient Greek coin with a date inscribed on it, unless, of course, it's a counterfeit. (The Naples Archaeological Museum has an entire collection of fake ancient coins that were really manufactured in the late 1700s. Ironically, they now have their own numismatic value!) The first bit of scientific absolute dating was dendochronology, counting tree rings. We know how old the oldest trees are. Radiocarbon dating was developed in the 1950s and since that time we have been able to determine the actual age of carbonized wood and bone at archaeological sites and know when human events in the immediate area occurred. There are now dating methods with exotic names such as paleomagnetic, fission-track, and potassium-argon dating. You can date a rock, but absent other relative or absolute clues, not the figure inscribed in it. Consider the problem here. You have a stele, a cut stone block that has been moved, certainly many times. Stratigraphy is useless since the original surrounding physical context is, without scientific rock dating, no help because you don't really care how old the stone is, just the figure cut into it. Seriation is the only solution—essentially, you ask yourself, What else have we seen that looks like this? What if there are different answers to that question that are widely separated in time? I did say it was a mystery. The only other explanation I can think of is that it's a hoax—medieval masons with a weird sense of humor. -Armanini, Michele. (2015). Ligures Apuani. Lunigiana storica, Garfagnana e Versilia prima dei Romani, Padova. - Catalano, Lara. (2008). La produzione scultorea medievale nell'abbazia San Vincenzo al Volturno. p.30. Suor Orsola University, Naples. -I Liguri. Un antico popolo tra Alpi e Mediterraneo. (2004) - anthology, various authors, Milano. -Guerrieri dell'età del Ferro in Lunigiana. (2001) - anthology, various authors, La Spezia. -The Oxford Companion to Archaeology, (1996). ed. Brian Fagan; entries on "Alpine Rock Art" (by C. Chippendale); "Petroglyphs" (by J.L. Schwauger); "Dating the Past" by George Michaels; "Stratigraphy" by Edward Cecil Harris. OUP, New York. - UNESCO website on Rock Art.